I've tried the conversion steps in your email and I have even rebuilt the menu from scratch in v3.9.2. In the Deluxe Menu Preview window, the drop-down sub-menus behave properly - transitioning down below the horizontal menu. But it FireFox3, IE7 and Chrome the submenus appear above the horizontal menu. Also... the transition effect (24 - Alpha Blend) only appears in IE7 - it is not evident in FireFox3 or in Chrome. > not evident in FireFox3 or in Chrome. Transitional effects are features of Internet Explorer 5.5+ only. 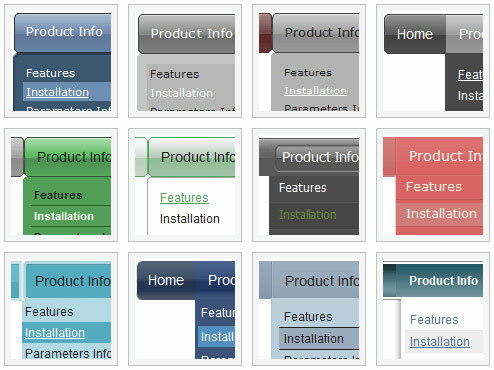 Q: Does your site navigation menu support RTL Pages? How hard it is to convert it this way? A: Yes it is possible to create a menu for right-to-left languages with Deluxe Tree in the same way as in standard htmlcode. Deluxe Menu support right-to-left languages. A: You can use wrapping in Deluxe Menu. 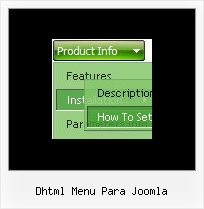 Would be nice to have dhtml menu as a built in option in joomla ..... Salón de la Joomlaesfera hispanohablante, Productos de Código Abierto para Joomla!